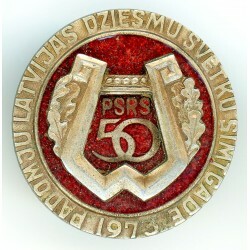 Latvian Soviet times badges and pin There are 2 products. 1973 Latvian Song Festival 100 USSR 50 ye. pin badge Item size: 26 mm diam. 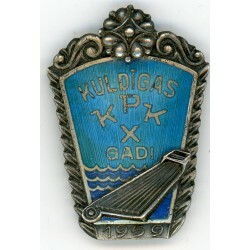 The Latvian soviet pin Kuldīga KPK in a good condition with enamel. Circa 59ies of 20th centure.Consistent with its age, Please see scans! Title- Kuldīgas KPK X gadi; 1959l.Owner's initials "G.Ž" engraved on reverse. Dimensions – apprx. 31 x 17 mm. Material - alpaca. The pictures are from actual item that you will recieve.